The Big Wobble: 80 percent of Bolivia's food crop in danger by a massive plague of locusts that is decimating crops in the country's agricultural heartland. 80 percent of Bolivia's food crop in danger by a massive plague of locusts that is decimating crops in the country's agricultural heartland. Bolivian President Evo Morales is declaring a state of emergency to fight a plague of locusts that is decimating crops in the country's agricultural heartland. Morales announced the decision Wednesday as part of a contingency plan. It includes $700,000 in additional funds for fumigation. 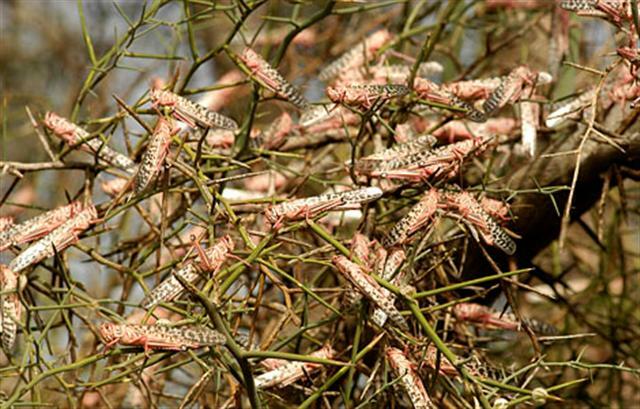 Officials say the swarm of locusts first appeared two weeks ago about 60 miles (100 kilometers) south of the eastern city of Santa Cruz. It has spread fast and is now about 18 miles (30 kilometers) from Bolivia's largest city. Bolivia's Eastern Agriculture Chamber estimates more than 2,700 acres (1,100 hectares) of corn, sorghum and beans have already been destroyed by the locusts. Authorities fear the locusts will reach the breadbasket region that supplies more than 80 percent of Bolivia's food unless there is extensive fumigation.